Indians are increasingly streaming content, with the end nowhere in sight. In a recent example, Spotify hit 1 million users here only one week after its India debut. Additionally, in the next few years, Digital India and 5G deployments are expected to make the number of connected devices and bandwidth swell. To deliver much faster download speeds and latency of just a few milliseconds, strength in the metro network is key. Increased network provider competitiveness by doing more with less and the ability to turn up services faster. Coherent technology is becoming the key pervasive technology across applications including: multi-haul (metro and long-haul – 100s to 1000s km), submarine (10,000km), DCI (10s to 1000s km), and now fiber in the access (low-cost metro access, Fiber Deep, 4G/5G, 10s -100+ km). Introducing Ciena’s 5171 Service Aggregation Switch and Service Aggregation Platform, purpose-built to address next generation Cable MSO access, 4G/5G RAN, and low-cost metro access—bringing coherent technology to the access space. Ciena is adding powerful new hardware and software capabilities to our Packet Networking portfolio to allow network providers and large enterprises to put more capacity closer to where the demand for bandwidth lives. The 5171 provides seamless MEF-compliant along with L2 and L3 services over a carrier class, connection-oriented environmentally hardened infrastructure. Ciena’s 5171 offers reduced edge transport and packet costs, footprint, and power consumption by integrating high-density aggregation with high-capacity temperature hardened coherent optics in a modular, scalable two rack-unit device. The fully non-blocking 800Gb/s packet fabric offers scalability for high-capacity 10GbE, 25GbE, and 100GbE applications, enabling the high-speed connectivity network operators need to ensure superior end-customer experiences and to improve their competitiveness. The 5171 offers efficient transport for Ethernet, MPLS-TE, or MPLS-TP, and future support of segment routing services with one of the industry’s first temperature hardened coherent packet-optical solution for aggregation, 4G/5G, and Cable MSO applications. The 5171 features Ciena’s WaveLogic 5 Nano flexible coherent pluggable to optimize capacity for street cabinets and other uncontrolled locations. Using CFP2-DCO form factor, WaveLogic 5 Nano is interoperable with 100G CableLabs Point-to-Point Coherent Optics PHY, OpenROADM MSA, and ITU-T G.709.2 FlexO. Ciena’s 5171 with WaveLogic 5 Nano raises the bar with temperature-hardened 100G for outside plant environments as well as enhanced 100G and 200G performance to extend the scale and ease-of-use benefits of the platform to metro and regional applications. The 5171’s sleek, shallow depth and front access is a perfect fit for external cabinets, controlled environmental vault deployment, and uncontrolled deployment of outdoor aggregation of 1/10/25/100 to 100/200 GbE, enabling high-capacity at the outdoor-edge. The 5171 addresses the increasing need for 100GbE services and high-density 10GbE aggregation, and will deliver high-bandwidth enterprise, mobile backhaul, and MSO services to maximize efficiency of network assets. The use of modern, hardened, lower-power coherent packet-optical technologies in the 5171 is a key benefit in eliminating the cost and complexity associated with deploying separate packet and optical devices. 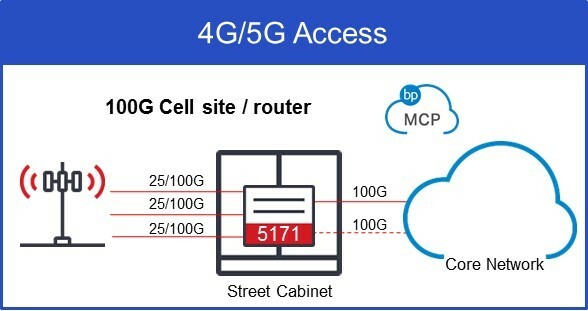 One of many service applications, the figure below shows examples of 25/100G wireless service delivery using Ciena’s 5171 Service Aggregation Switch for mobile backhaul or 5171 Service Aggregation Platform for “cell routing”. Using Ciena’s WaveLogic 5 Nano optics, operators can extend 100G to the cabinet and customer. The 5171 removes constraints on edge scalability. It will enable new revenue sources and help network operators respond to increasing traffic demands on high-capacity routes, while automating network operations to underpin aggregation, 4G/5G and cable access deployments. To learn more, check out our data sheets for the 5171 Service Aggregation Switch and Platform, or contact us to talk to an expert.